This screenshot from a video shows debris from a tornado covering a truck in Alabama, where at least 23 have been reported dead. 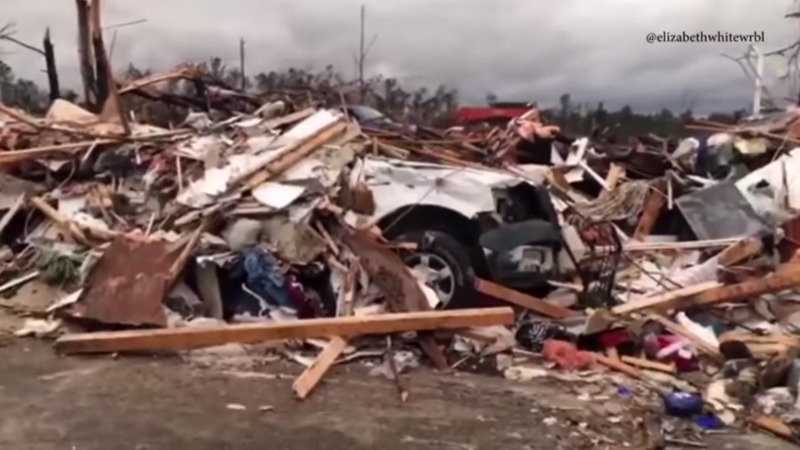 At least 23 people were killed after two powerful tornadoes ripped through communities in southeast Alabama Sunday afternoon, and officials said the death toll could rise as search efforts resume. “I cannot recall, at least in the last 50 years, and longer than that, a situation where we have had this type, this loss of life that we experienced today,” Lee County Sheriff Jay Jones told CBS News Sunday night. “We do have some children, unfortunately,” Jones said, also saying the “massive damage” included felled trees, damaged buildings, power outages, lost lives and debris strewn across the county. “The contents of one residence we know for a fact were located over 1,000 yards away,” Jones said. Lee County officials said the worst damage was near the town of Beauregard, which is about 60 miles east of Montgomery. Smith Station, another small county town, saw about 20 homes destroyed. The tornadoes were part of a larger storm system that moved through southern U.S. states. One Beauregard resident described the tornado as a “freight train” that left debris everywhere. Residents and news outlets were quickly on the scene to share pictures and videos of the widespread devastation. “It looks like someone took a knife and scraped the ground.” -Sheriff Jay Jones, Lee County Alabama describing the tornado damage. Rescue crews resumed working through rubble and wreckage Monday morning after bad weather delayed search efforts the previous night. The Sunday afternoon tornado through Lee County left a half-mile wide swath of devastation. The National Weather Service estimated the tornado’s strength to be at least EF-3, meaning wind-speeds were in excess of 136 miles per hour. That’s enough to easily tear away some buildings from their foundations. Once they were able, Posey said he and his neighbor loaded chainsaws and other equipment into a truck and headed over to the impacted area to help people. Posey is one of many volunteer rescue workers helping authorities. President Donald Trump implored Alabamians to stay safe, and warned that more severe weather could be on the way.